(Nanowerk News) Exactly four water molecules and one hydrogen chloride molecule are necessary to form the smallest droplet of acid. This was the result of work by the groups of Prof. Dr. Martina Havenith (physical chemistry) and Prof. Dr. Dominik Marx (theoretical chemistry) within the research group FOR 618. They have carried out experiments at ultracold temperatures close to absolute zero temperature using infrared laser spectroscopy to monitor the molecules. This has been accompanied by theoretical ab initio simulations. According to their calculations, the reaction at these extremely cold temperatures is only possible if the molecules are aggregating one after the other. Their results will be published in the newest issue of Science. If you put a classical acid, for example hydrogen chloride in water, the acid molecules will preferentially lose a proton (H+). Thereby the pH-value of the solution is decreased and the solution becomes acidic. In particular, so-called hydronium ions (H3O+), are formed by protonated water molecules. This hydronium ion is an important ingredient in many chemical reactions. Despite of the fact that this is one of the most fundamental reactions, it was not clear until now how many water molecules are actually required in order to form a charge separated negative Cl- ion and a positive H3O+ ion. “Whereas we all know acids from our daily life, we have now been able to observe for the first time acid formation on a molecular level.” „We will need this knowledge in order to understant chemical processes on nanoscopic structures, on small particles and on surfaces” explains Prof. Havenith-Newen. This indicates that there is a rich chemistry even at very low temperatures; a fundamental basis for reactions within stratospheric clouds or in interstellar media. Previously, it had been unclear whether reactions with only a few water molecules can take place at theses ultracold temperatures. For their experiments, the researchers have successively embedded hydrogen chloride as well as single water molecules in a special ultracold trap. They used nanodroplets of suprafluid helium which have a temperature of less than -272,8 °C. Molecules will first be cooled down before they have a chance to aggregate. “Suprafluid” is a special property of the helium which implies that the embedded molecules are still free to rotate before they are frozen, thereby allowing monitoring with unsurpassed precision. Captured in such a way, it is possible to obtain the chemical fingerprint of the acid – its infrared spectrum. 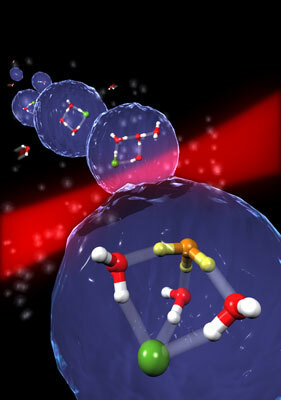 By combining trapping with high resolution IR laser spectroscopy and theoretical calculations, the chemists demonstrated that exactly four water molecules are required to form the smallest droplet of acid: (H3O)+(H2O)3Cl-. After these results, the researchers were left with the question of how this reaction can take place at ultracold temperatures near absolute zero. “Usually, activation of chemical reactions requires the input of energy, just like for cooking at home you need a cooking plate or a gas flame” explains Prof. Marx. “However, how should this be possible at a few Kelvin (close to absolute zero)?” The calculations, in combination with experiment, showed that the reaction is only possible by a successive aggregation process. Instead of putting together 4 water molecules and an HCl molecule simultanesously at the beginning and the waiting for a dissociation process to occur, they found in their simulations that when adding the water molecules step by step, a proton is transferred exactly when adding the fourth water molecule. Then, a hydronium ion will immediately form with one of the four added water molecules. This unusual mechanism is called “aggregation induced dissociation”. “We suspect that such aggregation induced reactions, can explain chemical transformations at ultracold conditions, such as can be found at small ice particles in clouds and in interstellar media”, explains Prof. Marx.